Equisetum Arvense Herba, a plant originated from Europe, has been widely used as a diuretic agent. 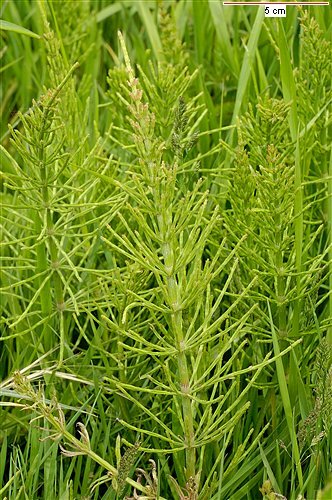 The use of Equisetum Arvense Herba has been found �... 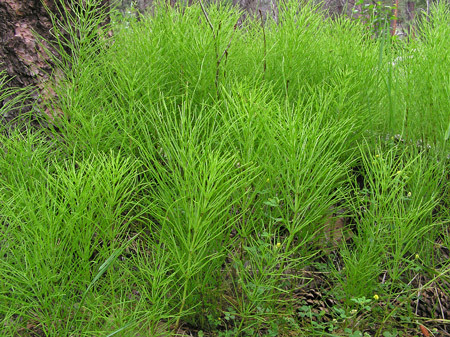 Originating in Europe, Asia, and North America, horsetail is a survivor from prehistoric times. This early plant has remained unchanged for millennia and once formed the vegetation that decomposed to produce coal seams. If I had an easy solution for controlling common horsetail (Equisetum arvense), I�d be a rich man But unfortunately this plant is very difficult to eradicate.... (Probaby Equisetum arvense). Where possible I have put six inches of pool liner between his weeds and my garden but they seem unfazed. They will send roots three feet in length under flagstone and come up through a well compacted bed of five/eighths gravel. Don't know that kind of Equisetum particularly, but around here E. arvensis is abundant. It can be grown from root-cuttings but is a moody plant: on my old grounds it grew like there was no tomorrow (great animal feed, good for tea, high mineralcontents) but around here I can't grow it if my life depended on it. 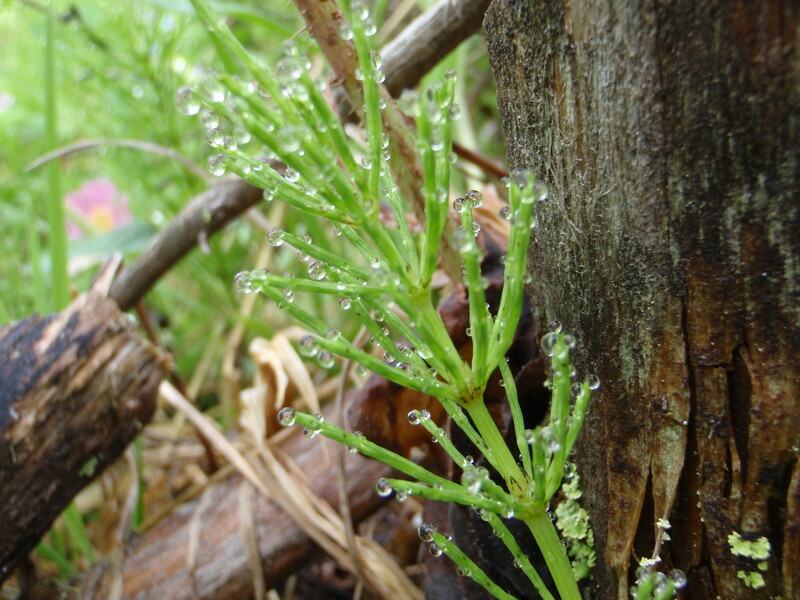 The extensive root system of horsetail (Equisetum arvense) makes controlling it very difficult prospect. Landscape fabrics or black plastic mulch can effectively prevent horsetail growth. Few herbicides are capable of killing off these weeds. Casoron (dichlobenil) can be used but it's safe use is dependent on the situation in which horsetail grows. Sterile stems are hollow, textured by 10-12 longitudinal ridges, and grow to 70 cm tall. 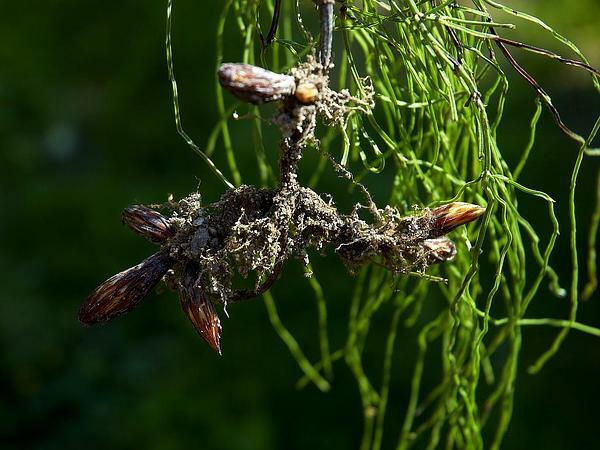 The fertile stems appear earlier than the sterile stems, grow to 30 cm tall and wither quickly. They are whitish to brownish, unbranched, fleshy, and thicker than the sterile stems. 2. Equisetum arvense, the field horsetail or common horsetail is a herbaceous perennial plant, native throughout the arctic and temperate regions of the northern hemisphere. The Horsetail descends from a prehistoric plant which covered entire forests during the Palaeozoic era 400 million years ago. This plant is a reminder of prehistoric times, when plants did not yet possess the ability to put out blossoms, a time when plants had a more primeval relationship to the mineral world, to water and to light.